Please note that this is not a free call. Drama Classes for kids aged 7 to 16 are designed to teach theatre skills and experience. The tutor is Robyn Donnelly (BSc, DipDrama). 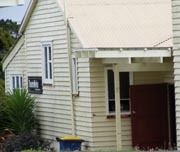 Many children who have been to these classes have subsequently appeared in, stage-managed, written and directed for Mairangi Players and other theatre groups. Full details here. We have excellent wheelchair access to the auditorium, but unfortunately not to our toilets. and get updated on what's going on at TheatreWorks. It's free. We will hold no personal details about you, nor will we pass on your email address - it will only be used for news emails about TheatreWorks. You can unsubscribe at any time. David Wood's play will be a hit with all, whether they know Noddy or not. Noddy and his friends are pitted against the sneering goblins and a greedy witch, in this funny and inventive adaptation. As in the original works, Noddy learns the value of friendship, hard work and honesty, through a series of adventures: building his house in Toytown, driving a car, outwitting his enemies, even surviving a hair-raising experience at Noah’s Ark! Noddy is a mix of adventure, morality tale and pantomime. SEASON: 5 – 13 July: bookings open soon. by Reginald Rose, directed by Ross Anderson. You can always check what's on at other community theatres - go to our Links page. Mairangi Players Inc. is a registered charitable entity, registration number CC22744.